The Race Is On: In late October, former U.S. Senator Mack Mattingly was exuberant at the results of a long-awaited vote – one that took place far from the precincts of Georgia. The voters of Panama approved a $5-billion-plus expenditure to expand and improve the Panama Canal to accommodate a new, larger class of ships knows as post-Panamax (wider than the canal will currently accommodate). Mattingly, who chairs the Georgia Ports Authority, sees the vote as starting a race of sorts between the Port of Savannah and the Panama Canal. At stake are billions in cargo traffic dollars from Asian and other ports of origin. Savannah’s port must be ready to accept the mega ships when they leave the locks of the new and improved Panama Canal for North America’s East Coast. Although Savannah got out of the starting gate much earlier on plans to deepen and improve its port to handle the deeper drafts of the modern shipping Goliaths, the effort is somewhat hobbled by a tangle of federal and state agency regulations. “I think we could see the first steps toward the port improvements in October 2007,” Mattingly says. The $411 million harbor deepening project is part of $1 billion-plus port upgrade, aimed at receiving the big ships. Rock ‘N’Roll: The 150 or so baby boomers gathered at the Georgia Music Hall of Fame in Macon earlier this fall found themselves transported back 40 years to their college campuses. The time machine: a 10-pound, nearly 600-page book with 800 photographs and an equally large title, The Heeey Baby Days of Beach Music: Stories and Remembrances of a Southern Music Genre. Price: a hefty $80. The book chronicles the adventures (and misadventures) of the Southern musical personalities who populated the college party band scene of the 1960s, including a number of Georgians. The evening included a book signing featuring the author, Waycross native Greg Haynes, now an Atlanta real estate professional. “I have been in love with this genre since I was 15,” says Haynes, who was a teenage music and concert promoter back in the ’60s. He may have hit a marketing bull’s-eye in his targeted audience. “I don’t think any generation has so fiercely clung to its music like ours has,” says Albany realtor Russell Martin, a player in King David and the Slaves, a Jesup ’60s beach music party band. Flying Solo: Social Circle’s cups surely runneth over after the opening of the Solo Company’s 1.3 million-square-foot distribution center. The huge building (it’s 1.5 miles around) will allow Solo to get its products to Southeastern customers much faster – 48 hours from order to delivery. But enough with the bad puns, says Social Circle’s affable mayor, Jim Burgess. “I’ve heard all that,” he adds. 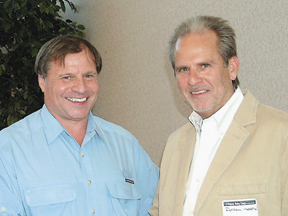 What Burgess does enjoy hearing was that the Solo plant is the largest industrial building constructed in Georgia this year and is a nice addition to a growing and varied economic base.